Corner Shelves: This corner shelving unit costs around $100 to build if you have to buy everything. It looks beautiful once it’s finished and you can stain or paint it any color that you need to match your existing decor. This would be great over the TV for holding movies and such or you could use it in the family room to hold games, puzzles, or whatever you need. Corner Door-Shelf: Use old door to build the shelf! Glowing Shelf: Use secret formula to make glowing in the darkness shelves! Full tutorial on the Shinium via Colossal. DIY Hanging Shelf : Create a unique spot to display your favourite things! 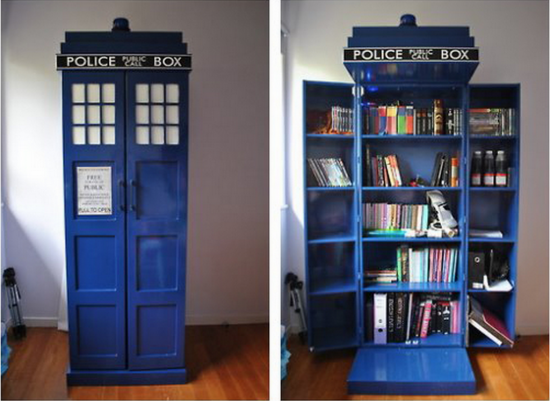 Tardis Bookshelf: Any Doctor Who fans in the house? You’ll love this fantastic Tardis Bookshelf that’s so much fun to make! These “invisible” shelves are great. Not only are they good conversation starters (people will think that your books are simpInvisible Shelves:ly floating on air), they’re also cheap and easy to build. They take up very little space and will hold loads of books. They’re perfect for dens, kids’ rooms, or your home office. Wrap-up + Rope Shelf: With the use of a few pieces of rope and two wooden planks, she made an extraordinary Wrap-up + Rope Shelf. DIY Magazine Copyright © 2019.